On 14th of November, Latvijas Banka issued a 2 euro commemorative coin featuring Latgale. The coin is legal tender in the Republic of Latvia and all the euro area countries. 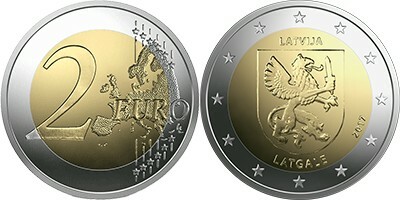 The issuing volume of the 2 euro commemorative coin "Latgale" is 530.000 pcs. The designs shows the coat of arms of the historical region of Latvia — Latgale. At the top there is the inscription of the issuing country ‘LATVIJA’ and at the bottom the inscription ‘Latgale’. At the right is the year of issuance ‘2017’. The coin’s outer ring bears the 12 stars of the European Union. The finely milled edge features the inscription DIEVS SVĒTĪ LATVIJU (God Bless Latvia), with the words separated by stars.